Playing along with the January sketch challenge over at Practical Scrappers today. My order of new Spring/Summer 2013 CTMH goodies is en route, so I was motivated to use up some retired stash to make room for the new! I wasn't sure what to use as a title for this layout. I settled on "Only in Canada" and my journalling talks about how we are probably the only country in the world where thousands of homeowners spend countless hours converting their backyards into hockey rinks for a few months each winter. Ha, am I right!?!? 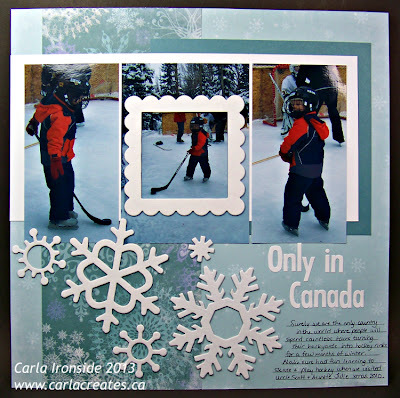 CTMH Alpha stickers - "Color Ready Bold"
I love the layout and that you have a hockey rink. Where I lived and live now, we couldn't do that, it just is not cold enough for long enough. Love this! I think the title is perfect! No one does that on Martha's Vineyard, Massachusetts, where I live. Love those giant snowflakes, too!